This lasagna has no noodles. Standing in for the noodle layers are zucchini sliced the long way. This is best accomplished with a steady hand and a mandolin slicer but it can be accomplished with a long knife, too. You’ll never miss the noodles. Try this one with kids and they will happily eat their veggies. Cut the ends off of your zucchini and discard them. Slice your zucchini fairly thinly – the long way. Less than a quarter inch thick is good. Just be steady handed and this will work. Don’t worry if they are not all perfect or some break. No one will ever know. Spray a cookie sheet with olive oil spray. Spread your zucchini on the cookie sheet so they don’t touch each other. Dust with a light grating of sea salt. Roast in a 350 degree oven for 12 minutes. Let set to cool while you prep the rest. Roasting the zucchini will take out some of the moisture so you don’t end up with soggy, watery lasagna. It’s worth the extra step. In a saute pan add your ground beef, the mushrooms and the onion. Break up the meat as it cooks on medium. Stir often. You want to cook this until the beef is cooked through but also until at least half of the moisture cooks off. Mushrooms give off a lot of juice so you need to cook them down. Add the spaghetti sauce and stir. Get it all mixed up. Add the pepper flakes if you want your final product to be a bit zippier. In a small bowl, add your ricotta cheese. Stir in the garlic powder and Italian seasoning. Set aside. Spray a 9-by-9-inch oven proof casserole dish. Now you’ll begin to layer. 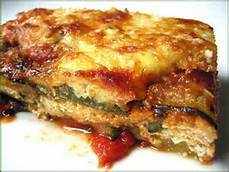 Add a layer of zucchini strips on the bottom. Then add half of your meat mixture. On top of that put in blobs of the ricotta mixture. Just plop teaspoons of the stuff across the top of the meat mixture. Maybe 8 – 10 blobs. Top that with your spinach. That makes a good middle layer to break things up. If it’s getting too high at this point gently press it down. Top with a little less than half of the mozzarella. Now add the other half of the meat sauce. More blobs of ricotta and a layer of mozzarella. Finally, spread your additional layer of zucchini strips. Top that with any leftover mozzarella and the parmesan. Bake for 45 minutes at 350 degrees. Watch for it to begin to brown toward the end. I like mine to have a nice crust. Be sure to let it sit for 10 minutes before you cut it. This will help it firm up but most importantly cool down so you don’t fry the roof of your mouth. Leftovers taste AT LEAST as good as the original -- if not even better. Just cut your portions and reheat in a casserole dish.